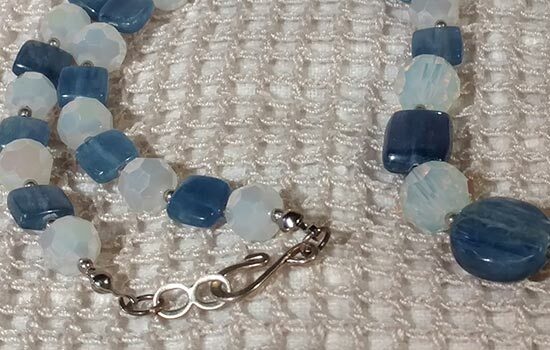 Pretty Blue Kyanite beads are accented with Sterling Silver beads and Czech opaque, faceted glass crystals to create a stunning necklace. Sterling Silver hook and eye closure. 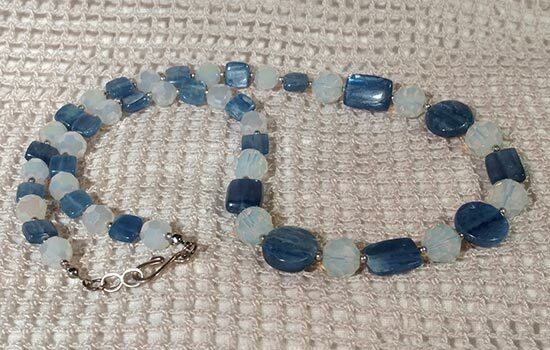 Blue Kyanite provides a calming effect to our inner world of stirred up emotions and inner images. It will encourage a pleasant and peaceful nature and liberate us from frustration and stress. Stabilizes balance between spirituality and daily life, aids in bringing spiritual values and abilities into daily use and supports spirituality as a way of life. Balances inward and outward energy flows. Clears, expands and aligns the aura bodies, stimulates intellect and mental activity, heals, opens and aligns aura with light and clarity. Kyanite, also known in some areas as Disthene, is formed during the metamorphosis of crystalline slates and has a Triclinic crystal system. It is in the mineral class of island silicates. It is generally found as crystals embedded in rocks rich in clay. Crystals can be found up to 12 inches in length, but are generally in the 2 to 4 inch range. Their coloring is usually distributed centrally and in splotches. Much has been found during building excavations in New York City, and massive veins have been found in Virginia and North Carolina. In Georgia, at Graves Mountain, it has been found in masses that also contained giant Rutiles and Lazurite. Blue Kyanite is one of the few healing gems which never needs cleaning or clearing on an energy level. It does not retain or accumulate negative energies or vibrations. It is very beneficial in aligning all the Chakras, and if directed consciously by its user can also open them. Blue Kyanite is best used by carrying or holding during mediation. This can be done for long periods of time. It is also very beneficial to lay on the Throat Chakra for problems in that area. Blue Kyanite helps in detaching ourselves from a belief in fate and enables us to recognize when and where we have created the causes effecting us later on our life path. 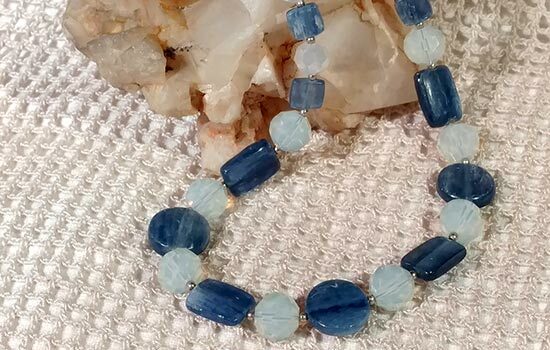 Blue Kyanite assists us in logical, rational thought and can provide spontaneous action when required. It is also very beneficial in providing conscious self-awareness. 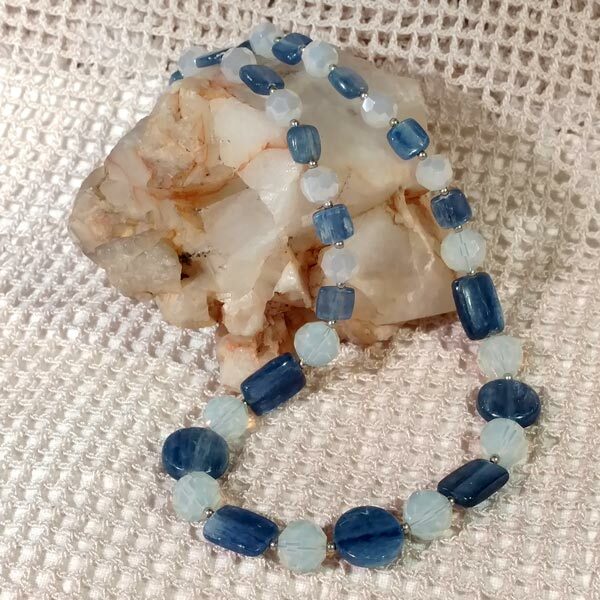 Blue Kyanite fortifies the functions of the cerebellum and the motor nervous system. This improves mobility and dexterity. 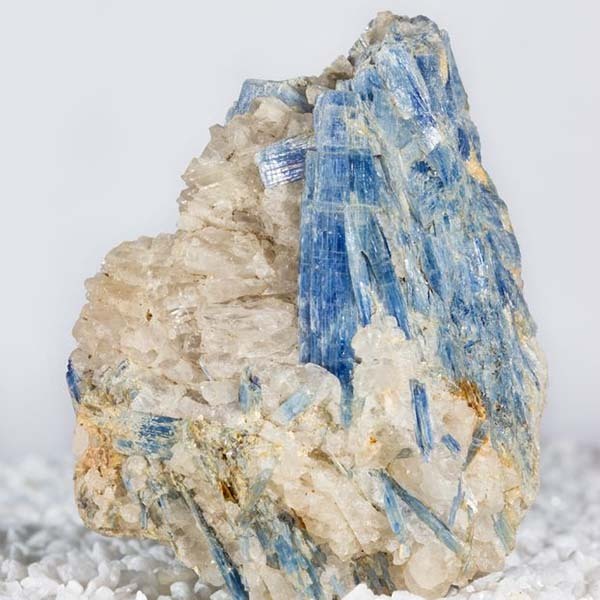 Blue Kyanite has a special affinity with Taurus, Libra and Aries. It has a Receptive Energy and its Powers are love, endurance and meditation. In days long passed, kyanos was a term used collectively for blue minerals (Azurite and Lapis). It wasn't until the 18th century that this gem received its name. Because of this, it is hard to trace folklore attributed directly to it. During the 19th century it was also given the name Disthene in France. Neither name has managed to become the 'one' and both are still used today in different parts of the world.